Assisi is one of my favorite towns in Italy, which is surprising considering our start there. We arrived in a pouring rainstorm, which gave us an excuse to take a taxi to our hotel. As we checked in, we re-verified that we indeed did have Internet access in our room, which was very important to us since we hadn't had it in the last hotel. Our room was actually in another building which meant that we were soaked again before we got there. I immediately set out to wash some clothes in our little sink while Lynda tried to get online. When I had everything washed and draped around the bathroom to dry, I went out into the room and Lynda told me that she couldn't seem to get Internet access. I got my computer out and tried it only to find that I couldn't get the Internet, either. Lynda went back to the front desk and was told that we would have to buy a pass that allowed us to have Internet access. She paid the fee for both of us and came back to the room. We tried again. Nothing. it after we had been told that we had Internet. It wasn't our fault that they had lied to us. I took down all my wet clothes and we moved to another room in the main building. We had Internet, but we also were surrounded by a bunch of kids on some sort of field trip. We made it work for that still-rainy night and decided move to another hotel the next morning. The morning dawned cool but clear and we found another hotel right down the street and got moved right away. We put our stuff away and set out to explore Assisi. I don't think we had a map with us - we just wandered in whatever direction looked interesting. This is the part of travel that I love - just wandering and exploring. OK, I am VERY frustrated here. I'm having a bunch of trouble with Google right now and I cannot get the photos I want to show you to upload here and I've been working on it for over an hour. Let's do it this way. Go to my Flickr account and then, on the right side, click on "Italy 2011" then click on "Assisi - May 2011". This will let you see all the photos I took in Assisi. 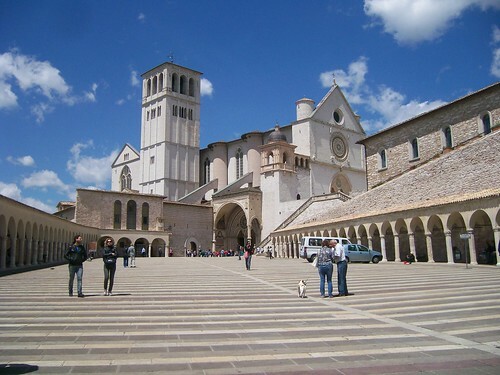 Now, the thing I love about Assisi is that we could have been walking around almost a thousand years ago and I don't think it would have been much different (except for the tourists). All of the buildings were built out of the same kind of stone. That was something we would see all over Italy, but it was a slightly different stone in each area. Everything was perfectly clean, but that may have been because of the downpour the day before. If you haven't yet checked out the photos, please go back up to the link to my Flickr page and check them out so you can see what I'm talking about. We walked along the narrow main streets, curious about the tiny side streets we passed but not ready to turn off yet. We were still trying to get our bearings. We were heading downhill the whole time and I was beginning to dread the walk back up when we rounded a curve and saw the Basilica of San Francisco. This was just our first exploratory walk - we weren't looking for the Basilica and hadn't yet read anything about it, but we decided that we might as well go in since we were there. In my opinion, this is the most beautiful church of all that we saw over the three weeks we traveled in Italy. Well, maybe St. Marks in Venice ties it, but it's a different kind of beauty. The Basilica of San Francisco shows the community's love for it's native son, who was born here in 1181, and the country's love for it's patron saint. The building is huge! You can't even see that from the inside or the front - you have to see it from maybe a mile away and down the hill to realize it's enormity. The structure is fairly simple. The fanciest work I saw was the stone work around the windows at the entrances and the carved wooden choir stalls. Mostly, though, the basilica's beauty is in it's simplicity. And the artwork... The walls inside are almost completely covered with paintings by Simone Martini (1284 - 1344), Pietro Lorenzetti (1280 - 1348), and Giotto (1266 - 1337). The paintings are beautiful and bright and colorful. Many look like they were painted last year. The whole place is a wonderful medieval art museum. Unfortunately, they don't allow photos, so here is another link so you can see what I'm talking about and learn more about the basilica. After stumbling around in amazement for hours, we finally decided that we had seen all there was to see, stopped by the gift shop to pick up small books with the photos we had not been allowed to take, and headed back toward the center of town. Now we took the time to explore every little alley and side street we saw. Since Assisi is a hilltop village, many of these streets were very steep. Some were really just paths and others became stairways. We headed in the general direction of our hotel, but at each fork in the road/path, we chose the one that looked the most interesting. We discovered lots of little shops - an excuse to stop and catch our breaths on the really steep parts. Our final stop was in a delightful little deli off the main square where we bought some cheeses and a bottle of wine for the next day's train trip to Siena.